The creation of fiat official government money has had a profound effect in history and on our nation and the world today. “Fiat” means it is worth whatever the government says it is (its face value), although the material of which it is made may have more or less intrinsic market value. Examples would include both valuable silver dollars and worthless paper, each declared to be worth $1; and today’s American Eagle bullion coin with a face value of $50 for one ounce of gold. When a country creates too much fake money, sellers avoid it for payment. Photo: David Muir. Normally, when a country creates too much fake money, sellers avoid it for payment, or stop buying its bonds due to its falling value, and the party is soon over. However, the U.S. is in a unique position never seen in the history of the world. Our fiat paper money is the primary de facto world’s “reserve currency” (anyone will accept it for payment and keep it as cash, or as a dollar-denominated asset; banks keep it as their reserves, like gold). We can create new money out of thin-air, and sellers of goods and services worldwide will accept it. We can also pay our debts with it, even as the federal government spends to excess. We have abused the privileged status of the U.S. dollar in many immoral and counterproductive ways. It is the underlying cause of our major problems, such as jobs being exported due to excess imports of goods (other countries would run out of money; the U.S. can create more as needed! ), strange banking and securities deals based on loose money, excess personal spending and debt, and wars. One cannot underestimate the importance of our ability to pay debts to other nations, and not be required to convert to their money. This conversion would normally trigger market valuation, which could collapse the value of the U.S. dollar. Conversely, other nations must buy dollars to pay for most imports, and face declining exchange rates if they have expanded their money supply too much. We have abused this reserve status, and as of mid-2009 other nations started seeking alternatives (yuan, yen, a basket of currencies, etc.). Most people are not aware that the reserve currency is used for most payments between other nations; for example, India pays Brazil for coffee with U.S. dollars. Hence, all nations keep a supply of U.S. dollars to use in trade. All banks are required to have sufficient reserves in order to show a strong asset base for the bank’s obligations (mainly demand and time deposits). Since the USD has been valued by the world system to be “as good as gold,” it is known as a reserve currency and used instead of gold to fund these bank reserves. The Dollar has been used in about 90% of international transactions since its ascendancy in the 1920s, but has become weaker since 2000, and declined to 70% or less by 2009. About 30% of international deals are now done in Euros and Yen, but that is increasing as the economies and currencies of China and others grow stronger. Indeed, China started using its yuan for international transactions in 2010, and also allowed foreign firms to create yuan-denominated private equity funds. There have been a series of international agreements to manage currency. The International Monetary Fund (IMF) and World Bank were born of these deals. Both are counterproductive causes of spending and distortions (including feeding corrupt governments), and should be abolished along with the Federal Reserve. Redeemability was restricted more and more until the 1944 Bretton Woods agreement, which set rules to: 1) Allow only nations to redeem paper for gold between each other (not people; a form of the Gold Bullion Exchange standard). 2) Create the International Monetary Fund (IMF) to handle its transactions. 3) Set the USD as the world’s official reserve currency, with a fixed value of $35 per ounce of gold. There can be no other criterion, no other standard, than gold. Gold that never changes, that can be shaped into ingots, bars, coins . . . that has no nationality and that is eternally and universally accepted as the ultimate fiduciary value par excellence. France started redeeming their paper dollars to gold, but Nixon soon refused to remit gold to any nation (we were running out), and then abrogated Bretton Woods on Aug. 15, 1971, setting the dollar “afloat” with no redeemability. Within a few years, all nations had done the same, including conservative Switzerland. Whoopee! Everybody could make money out of thin air! It took $1,202.05 in the year 1912 for the same purchase power as $1,000 in the year 1774 (a 17.7% loss in 138 yrs, or 0.13 % per yr). It took $22,427.40 in the year 2008 for the same purchase power as $1,000 in the year 1913 (a 95.5% loss in 95 yrs, or 1.0% per yr). Almost eight times worse than before the Fed! 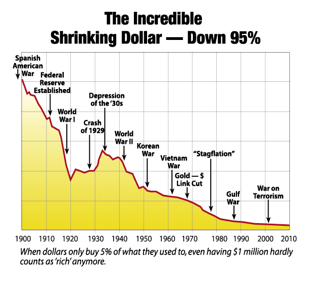 The US dollar has lost over 95% of its purchasing power since 1913 due to excess monetary inflation by the Fed by creating new money to pay bills. This has been the main cause of the 2,000% increase in prices since 1913. Excess money creation prior to 1913 resulted in short-term inflation and panic runs on insolvent banks, but the Fed allowed long-term abuse by bailing-out such banks, which in turn caused the moral hazard of the banks taking excess risks by seeking casino profits for the last 97 years and counting! A special monetary expansion event occurred in late 2008 when Bernanke produced the now infamous Bailout Spike by injecting almost $1 trillion of new money into the U.S. economy. 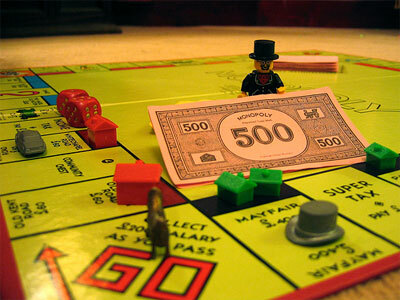 On April 15, 2008, the Fed held $866 billion in assets, which served as the monetary base for the nation. On April 15, 2009, it held $2.2 trillion. A decline in purchasing power of the dollar will follow this increase in the money supply. Internationally, the USD emerged as the world’s reserve currency after WWI because all fiat paper money is actually viewed as a share in the economy of the issuer. Thus, the paper of a large and stable government and economy has good value; it is the best choice within the world’s fake money system. Until recently, the U.S. was without question the world’s strongest economy, and thus the USD had good value as a share in USA, Inc. Since 1971, however, the U.S. has abused its currency by inflating its supply even more than other countries, borrowed and spent to excess, and the dollars’ value has subsequently decreased (prices increased) rapidly ever since on both the international exchange basis (about 4:1 against western Europe legacy currencies from 1971 to 1999, then a loss of about 2:1 against the Euro from 1999 to 2008; 0.8 to 1.5 US$ per Euro), and by about 10:1 domestically (price increase of cars, pizza, etc. ; things not subsidized or under price controls). Thus our share of USA Inc. is decreasing in value and confidence as viewed by other nations, and they are seeking less dependency on the USD as the primary reserve currency for the world. This has massive implications on our ability to create new money to pay our bills to other countries, and could result in a crash (loss of 50% or more of purchasing power) of the U.S. dollar. During the 2000 to 2007 boom times, Wall Street had been “securitizing” bundles of various weak and bad debt instruments (subprime mortgages, credit card debt, etc. ), then getting their complicit rating agencies (Moodys, S&P, etc.) to falsely label them AAA. By doing so, they could sell them worldwide to get them off their books, and then make more money by making new loans to other weak borrowers. Foreign banks and investors happily bought trillions of dollars of these securities because they were primarily based on U.S. real estate, had high interest income, and were apparently backed by the U.S. government. The process was corrupt from the start, but was pushed by Congress and Wall Street elites, many of whom made hundreds of millions each in bonuses. As the false prosperity slowed, and caused loss of U.S. jobs, then mortgage foreclosures, these fake securities lost value, and the worldwide crash started in late 2008. The countries we buy imports from (China leads) accumulate billions of U.S. dollars and buy our T-bills to get some interest (and help feed future purchases?). This is a recycling of fake money, with interest paid by fake money, with all parties hoping it will last forever! There are signs that the game might be up: China and Russia suggested at the Jan-2009 World Economic Forum in Davos that a new system is needed to replace the USD as the world’s primary reserve currency. It has been a fun party since 1944, but our era of financing wars, Empire-USA, foreign aid, imports, and homeland spending with fake money is about to end. Other nations are tired of, and can’t afford, our exorbitant privilege of being both a fiat currency and the world’s primary reserve currency. David Redick has authored two books Monetary Revolution USA , and Rebuild America Now . Mr. Redick is a “Ron Paul Style” Republican running for Wisconsin and supports establishing a state bank.